You may be thinking that you either don’t have the time or the level of investment to work on your business now. But if you’re too busy working in your business rather than affording yourself the opportunity to work on your business, then you and your business may be at risk. 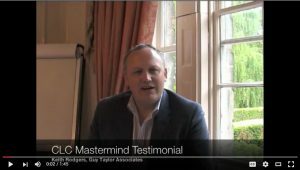 When you invest in the CLC Mastermind, the potential rewards for your business are huge, so long as you put in the commitment, time and effort into it. Your investment in the programme can be earned back in full in less time than you can imagine. * a range of special guest speakers. These exclusive, engaging and experiential programmes have been designed to help you achieve your desired results and realise your return on investment within a relatively short timescale. This is achieved by you applying what you have learnt directly into your business; having the confidence to make strategic and operational decisions; and being prepared to be held to account. ****If you are not satisfied with the programme, we are happy to provide you with a full money-back guarantee provided that your withdrawal is before delivery of workshop 3; you return all materials received to that date; you have attended the first two workshops; and you have completed all the inter-workshop activities and actions.